Wednesday, April 25, 2018, 4:30-6 p.m.
Free copies of Maidenhair will be available for students! 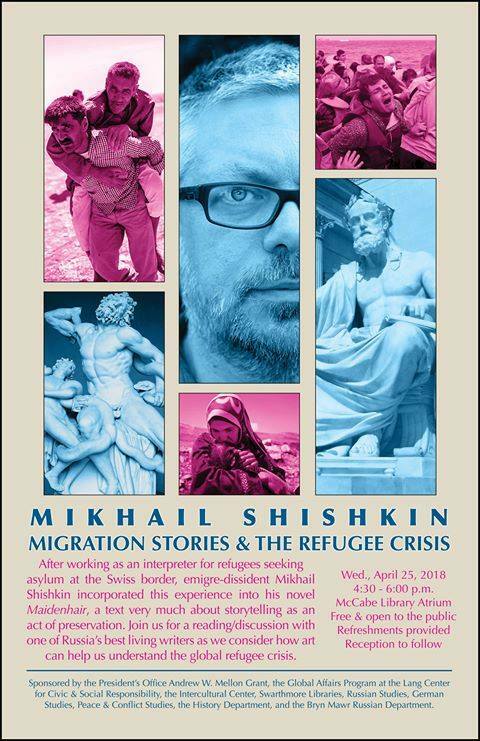 After working as an interpreter for Russian-speaking refugees seeking asylum at the Swiss border, emigre-dissident Mikhail Shishkin incorporated this experience into his novel Maidenhair. The stories he presents offer a more human(e) perspective that encourages empathy, that transcends statistics by delving deep into the stories of the displaced, and that emphasizes the power of storytelling as a means of preservation. Join us for a reading and discussion with one of Russia’s best living writers as we consider how art can help us understand the global refugee crisis. In addition to his reading, Shishkin, who is the only writer to have won all three of Russia’s top literary prizes, will speak about his work in Switzerland and take questions from the audience for a wide-ranging discussion. For more information, please contact José Vergara (jvergar1@swarthmore.edu). Co-sponsored by the President’s Office Andrew W. Mellon Grant, the Global Affairs Program at the Lang Center for Civic & Social Responsibility, the Intercultural Center, Swarthmore Libraries, Russian Studies, German Studies, Peace & Conflict Studies, the History Department, and the Bryn Mawr Russian Department.